Apple invention would allow one self-driving car to recharge another — while both are moving! Apple has been granted a patent (number 10,108,202) for a “peloton” that involves a self-driving car. Actually, two self-driving cars. The term “peloton” usually refers to a pack of bicycle riders. In this case, Apple uses it to refer to at least two vehicles traveling together. If I’m reading the patent correctly, the company’s invention involves one of the vehicles being able to recharge the battery of the other — while both are moving! 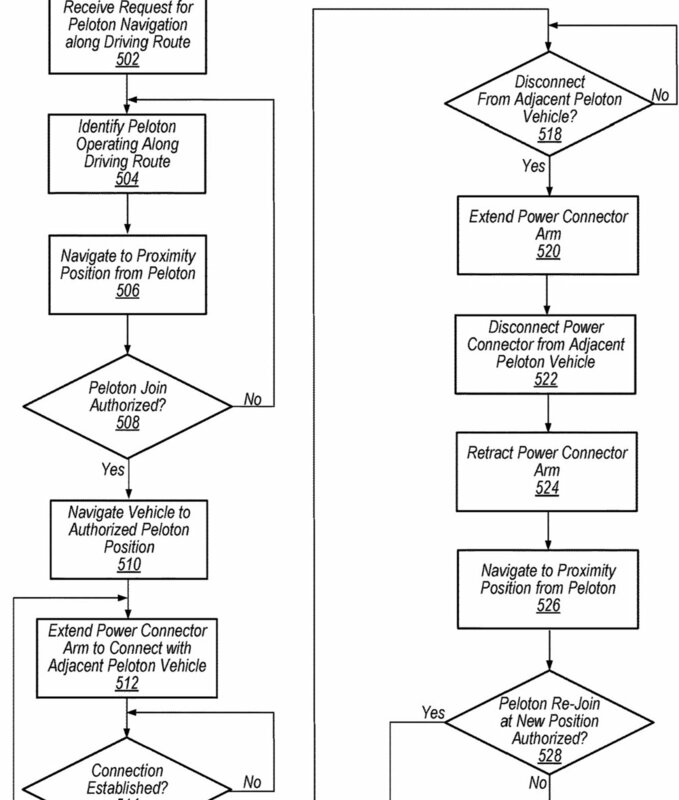 In the patent filing, Apple notes that the rise of interest in autonomous navigation of vehicles, including automobiles, has resulted in a desire to develop autonomous navigation systems that can autonomously navigate (i.e., autonomously "drive") a vehicles through various routes, including one or more roads in a road network, such as contemporary roads, streets, highways, etc. Such autonomous navigation systems can control one or more automotive control elements of the vehicle to implement such autonomous navigation. Such control by the autonomous navigation system in a vehicle can be referred to as autonomous driving control of the vehicle. Apple says that, in some cases, a navigation range of a vehicle from a given location is at least partially restricted by the internal energy storage of the vehicle, which can include fuel, electrical power, etc., which are consumed by one or more engines included in the vehicle to cause the vehicle to move. While a vehicle can stop at a refueling station, recharging station, etc. to replenish internal stored energy to extend the navigation range of the vehicle, such stops can extend the duration of a trip. In addition, in some cases, such stations may be at least partially absent from a driving route along which the vehicle is navigated, thereby complicating navigation of the vehicle to a destination location which is beyond an initial navigation range of the vehicle. Here’s the summary of the invention: “A vehicle configured to be autonomously navigated in a peloton along a roadway, wherein the peloton comprises at least the vehicle at least one additional vehicle, is configured to determine a position of the vehicle in the peloton which reduces differences in relative driving ranges among the vehicles included in the peloton. The vehicles can dynamically adjust peloton positions while navigating to reduce driving range differences among the vehicles.